Having already tried their other products, we were excited to review the CBDistillery 1000mg tincture. This is a company that has always managed to create very good products at very good prices. We set out to find out if they’ve done it once again. CBDistillery is perhaps the definition of a quick riser. They’ve only been around since 2016, but have already made a massive impact on the market and become a consumer favorite. Perhaps it’s their activist streak, as the three Coloradoans who founded the company are users themselves who are intent on sharing the benefits of CBD. The CBDistillery sells a full spectrum CBD tincture, which is actually listed under Hemp Oil on their website. They come in 15ml and 30ml bottle sizes and in several strengths (mg of CBD per ml). Some of their products are isolate based but keep in mind that their tinctures are all full spectrum. They extract CBD along with other cannabinoids and terpenes from hemp plants that are non-GMO and pesticide free. CBDistillery CBD tinctures have been 3rd party tested with the results listed on each product’s page. 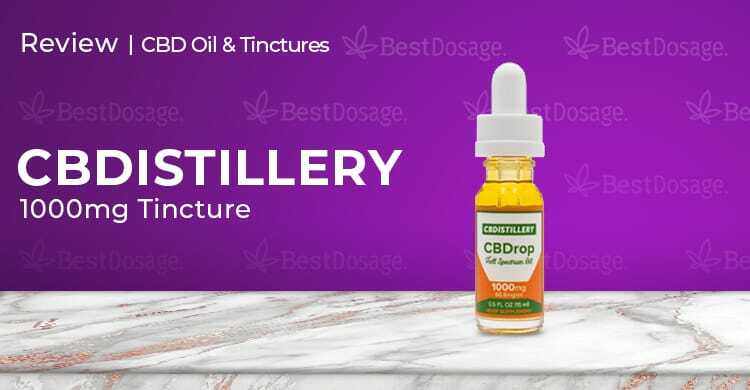 The 1000mg tincture is called the CBDrop by CBDistillery. The CBDrop 1000mg bottle looked unassuming when it arrived. As it is, the potency level of 66mg per ml is still a nice ratio. This was clearly printed on the bottle, the other side of which gave instructions and product information. The packaging has the feel of something very professionally done, which added to our impression of a serious company. Cracking it open, the top dropper was sealed tight and was easy to handle. We pay special attention to how delicate droppers are so that you can microdose easily, and the CBDistillery CBD tincture passed with flying colors. In terms of taste, this is a full spectrum product so you’re expecting a green herbal type of flavor and that’s what we got. It wasn’t overwhelming to most of us, but the most sensitive member of our team didn’t take to it too well. This is, after all, extracted straight from the hemp plant so it’s to be expected. At about 3.3mg of CBD per drop, you’ll want to have a good idea of how much you need for your ailment. Start slow and move up, which is always the preferred policy. The label lists a serving as .5ml which is half of a dropper or 3.3mg of CBD. For relaxation and anxiety, you may want to start with less, but if you are treating pain then a full serving could be fine. Each person is different, so always exercise care when dosing. We had some great experiences using this CBDistillery CBD tincture. For anxiety, it did a very nice job and set in pretty quickly. For those of us who were looking for pain relief, it worked well but we had to up the dosage to really do the trick. Might be that their higher mg CBD bottles would bode better for pain. It did absolutely nothing for us for insomnia, which was a bit surprising. Offering both live chat and email is a great way to make us fans of our customer support. Responses were rather prompt most of the time, although there was one exception on a live chat that we just waited and waited. Overall, very solid in this department. $60 for this bottle. They range from $35-$240 per bottle. They offer full spectrum CBD in small and big bottles, in five different potency strengths. Known for being able to bring a high-quality product to the market at a reasonable price, CBDistillery delivers again here. We’re probably bigger fans of their vape pen, but this tincture does the job too. If you don’t mind a more pronounced hemp flavor, you’ll get a great value picking up the CBDistillery CBD tincture 100mg bottle, or going for an even bigger bottle. This is another very good product from a company we like a lot and one that we definitely recommend.